We have many ways of communicating with each other - many potential channels. Some are almost instant, some are slower. We can write a letter and post it. The letter may take several days to arrive at the address on the envelope, but once there it can have a lasting influence on the recipient. It is a relatively slow way of communicating, and has somewhat gone out of fashion, but there are times when a letter is the best form of communication. Alternatively, we can call by ‘phone and have a real time discussion with the person at the other end. Or via the internet we can send an email, or a tweet, or update our Facebook page to let people know what we are doing. These are rapid and now popular ways of keeping in touch and sharing information, news, and opinions. And through the medium of television we are kept aware of what is happening in the world - events, culture, and politics. 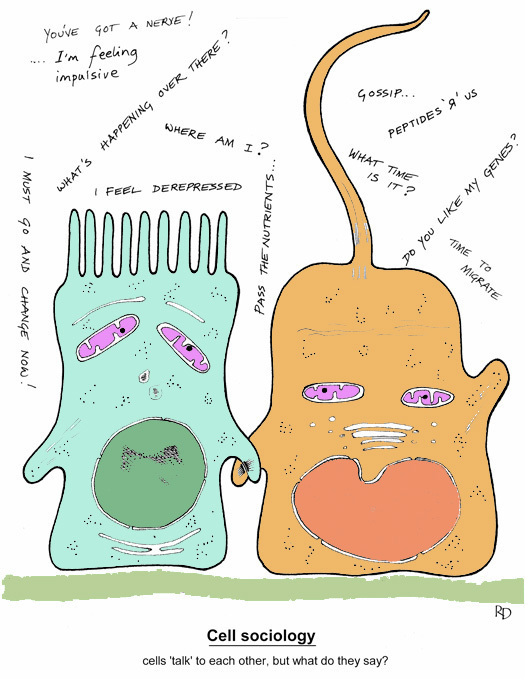 Like us, the cells forming the body live within a society, a cellular society. For each cell to play its part effectively, it needs to be in communication with other cells - its immediate neighbours and others throughout the body. It needs to receive information, and to provide information. Like us, cells have access to different channels of communication, some slower and others very rapid. Often, when we consider communication between cells, we think in terms of the exchange of chemicals such as hormones or neurotransmitters. However, cells probably communicate in other ways too, perhaps involving electrical charges or direct contact for example. In what follows, we shall focus on two major communication systems in the body - the nervous system which ramifies throughout most parts of the body and has a rapid influence, and the hormonal system which can have whole-body as well as local effects on a rather slower time scale. Two major body systems are involved in 'global' control of body processes: the nervous system and the endocrine system. The nervous system tends to have a rapid, often localised effect that is short-lived, while the endocrine system tends to have a slower, more generalised effect that is longer lasting. So the nervous system resembles communication by telephone and the internet, while the endocrine system acts in a way that is more like sending letters. There is also communication between cells at a more local level by way of chemical signals called cytokines, rather like having a chat with your neighbours. The nervous and endocrine systems oversee ‘global’ homeostasis, while communication between cells at the ‘local’ level helps to sustain ideal local conditions and deal with local problems. Think of the differences between central government, which enacts a legal framework applied throughout society and makes major decisions about the economy and foreign policy, while local governments are more concerned with detailed changes to local infrastructure and services, working within the constraints set by central government. The nervous system continuously collects sensory information from almost every location within the body as well as from the surrounding environment. It filters and analyses that information, draws on memories of past experiences, and decides what to do next. It then initiates and control appropriate muscular movements and glandular secretions by way of motor nerves. Thus the nervous system provides a high-speed communication and information-processing network throughout the body. Much of the neural processing takes place in the brain and spinal cord, which together are called the central nervous system. The nerves attached to the central nervous system ramify throughout the body form the peripheral nervous system. Information flowing towards the central nervous system is called sensory information - this includes the general senses such as pain, temperature, touch, position sense and also the special senses such as vision, hearing, taste, smell, and balance. Information flowing away from the central nervous system towards muscles and glands is called motor information. Some activities we have conscious control of, for example movements of the different parts of our body. The nerves giving us that control are called somatic motor nerves. However, processes such as digestion and the pumping of the heart usually occur without our immediate awareness, and usually without conscious involvement, so their nerve supplies belong to the autonomic nervous system. The highly-differentiated cells that are the main building-blocks of the nervous system are called neurons. 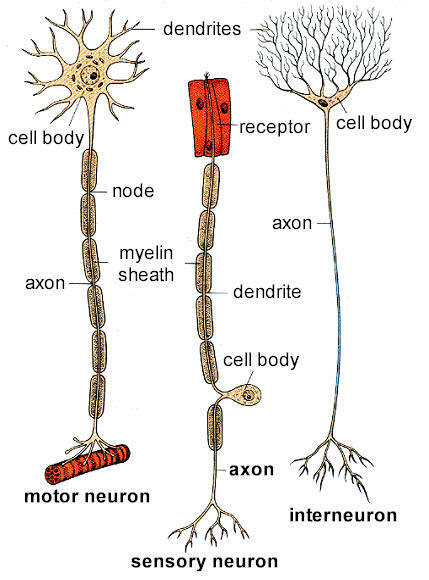 They transmit nerve impulses along extensions called axons. They send impulses when stimulated to do so by other neurons, or when reacting to stimuli such as touch, temperature, pressure, pain, light, taste, smell, or sound. 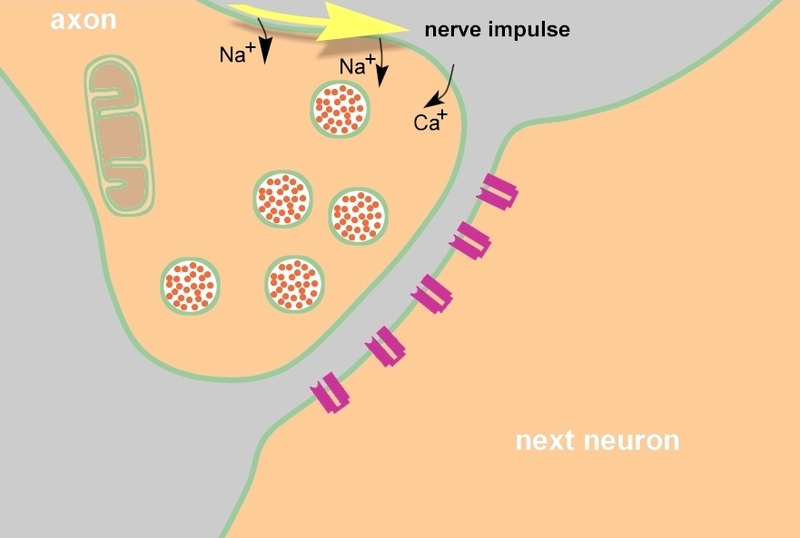 When a nerve impulse reaches the end of an axon, it causes the release of a chemical called a neurotransmitter. This chemical crosses a small gap between the end of the axon and the next cell, which might be another neuron, a muscle cell, or a glandular cell. Nerve impulses are transient events involving changes in electrical potential and movements of ions across the cell membrane of the neuron. 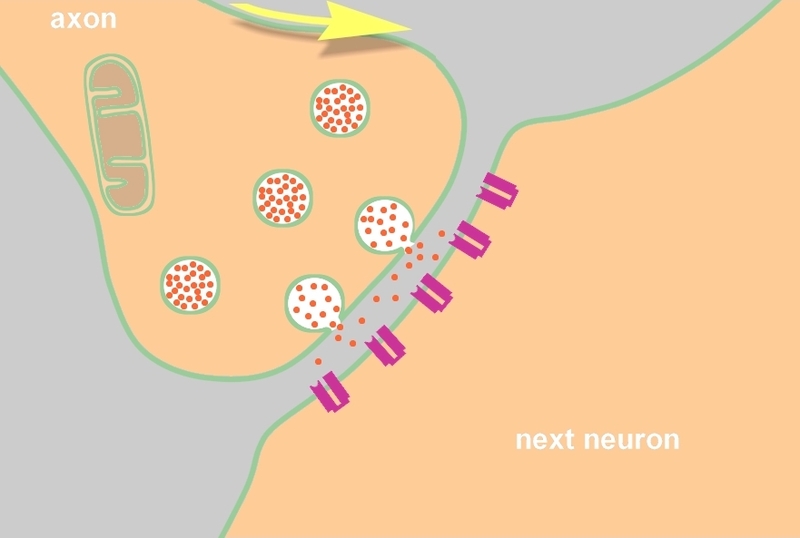 A resting neuron maintains a negative electrical charge compared with its surroundings. 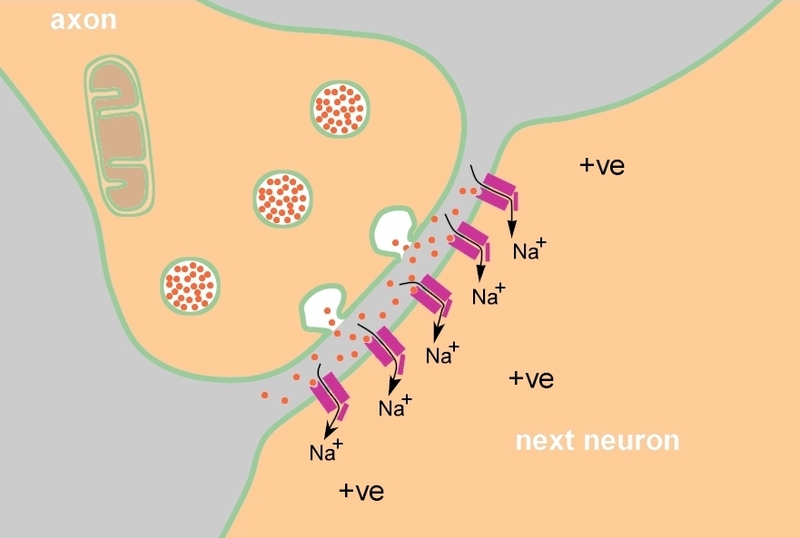 This resting potential makes neurons very sensitive or ‘excitable’, and when their dendritic region is stimulated appropriately a wave of depolarisation passes along its axonal membrane as sodium ions (Na+) flow in and potassium ions (K+) flow out. This nerve impulse is also called an action potential. The speed of conduction of nerve impulses is directly related to fibre diameter - thicker axons conduct more quickly. Also, myelinated fibres conduct more quickly than unmyelinated fibres. Myelin is an insulating material wrapped around axons by supporting cells. The small gap between the end of an axon and the cell membrane of the next cell is called the synaptic cleft. 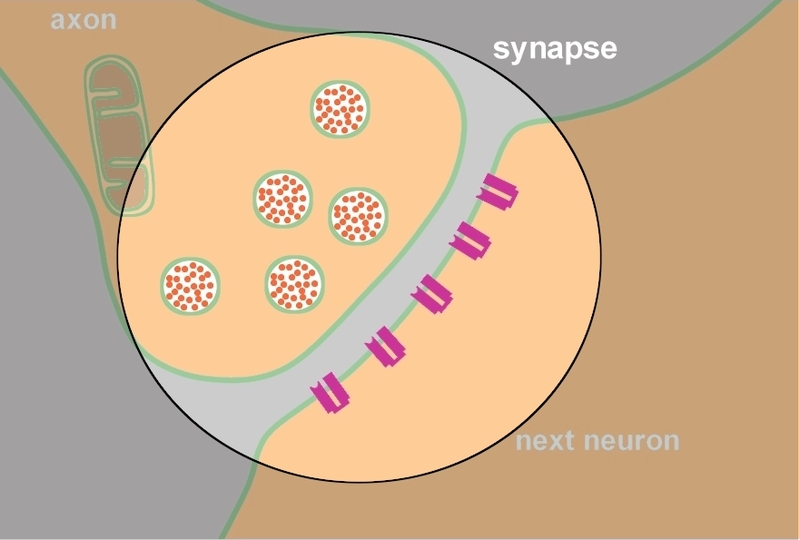 The end of the axon and the immediately adjacent part of the next cell collaborate to form a specialised structure called the synapse. The nerve impulse triggers the release of a chemical which crosses the gap - this chemical is called a neurotransmitter. Peripheral nerves generally use the neurotransmitters acetylcholine and noradrenaline. In the brain, other neurotransmitters are used, for example dopamine, serotonin, and glutamate. After use, neurotransmitters are quickly broken down and recycled. 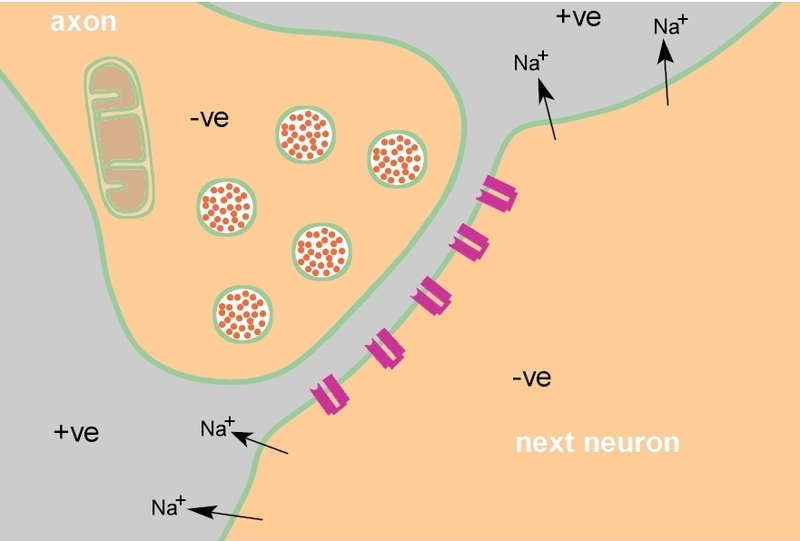 Because of the way that synapses are organised, nerve conduction can occur in one direction only. The communication across synapses by way of neurotransmitters can be modified by drugs, and this knowledge is used in the treatment of a wide range of conditions such as depression, schizophrenia, pain, and Parkinson's disease. The endocrine system also sends chemical signals from one cell to another, but instead of releasing neurotransmitters into a synaptic cleft, the endocrine glands secrete their signalling molecules into the blood to be carried throughout the body. These signalling molecules are called hormones. If a cell has the appropriate receptor (specialised protein) for a particular hormone, it will pick up the signal and respond to it. Their chemistry affects the way they work. Peptide and catecholamine hormones are water-soluble. They are detected at the cell surface and produce an effect through 'second messengers' within the cell. Steroid and eicosanoid hormones are fat-soluble and can easily pass through the cell membrane into the cell where they are detected by receptors and have a direct effect. Some hormones are released when an endocrine gland is stimulated by the nervous system. An example is the adrenal medulla, which is stimulated by preganglionic sympathetic fibres to release adrenaline and noradrenaline. These catecholamine hormones cause the characteristic ‘fear, flight, or fight’ responses. 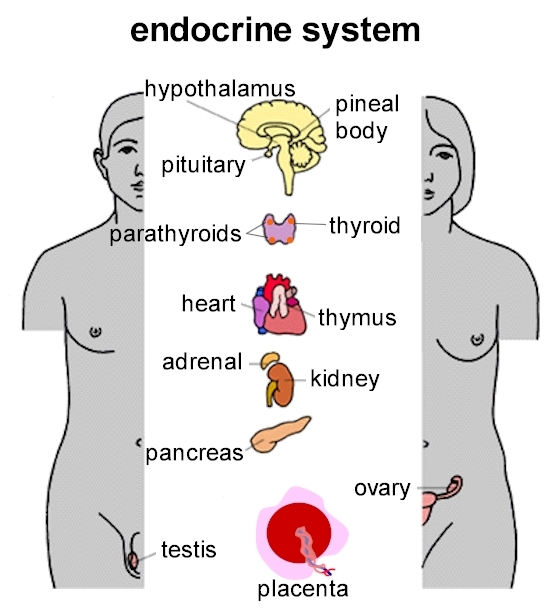 Other endocrine glands monitor the composition of fluids around them and release hormones when required. Examples are the pancreatic hormones: a rising blood glucose level causes the pancreatic islets to release insulin so that cells can take in glucose; a falling blood glucose level inhibits insulin release and stimulates glucagon release, causing the liver to mobilise glycogen stores and release glucose. In recent years, we have discovered that cells communicate regularly with each other over short distances, rather like neighbours in a community. Many signalling molecules have been identified and most are peptides (small proteins). These are generally called cytokines. Short-range signals influence things such as the local blood supply, rates of cell division, and response to injury and infection (the inflammatory response). 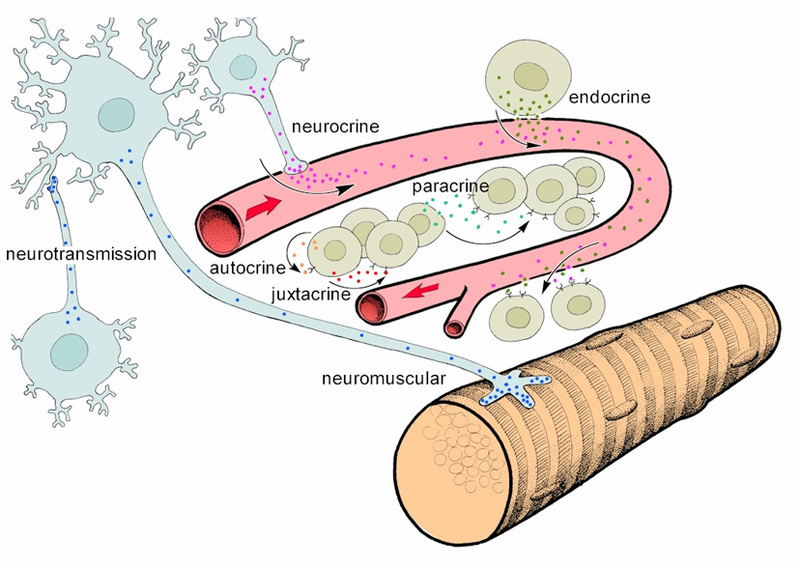 The release of signalling molecules for local effect is called paracrine secretion. So communication between cells occurs mainly by the release and detection of chemical signals. Nerve impulses and hormones are used for longer-range communication, while cytokines and other chemical signals are used more locally. Effective communication ensures harmonious cellular activity in the body.